According to The National Academies of Sciences, Engineering, and Medicine, an adequate daily fluid intake is about 15.5 cups for men and about 11.5 cups a day for women. That’s because every cell, tissue and organ in your body needs water to function properly. Apart from literally needing it to survive, water has a slew of benefits including increased energy, temperature regulation, joint lubrication and much more. The latest benefit to join this list: increased brain power and productivity. Staying hydrated may be the key to higher productivity at work. Drinking water in the workplace is crucial for productivity and mental alertness. Our brains are 85% water and they depend on it in order to work properly. Dehydration not only lowers mental capacity, but can also cause fatigue, poor digestion, headaches and sore joints. According to the researchers, people see a 14 percent increase in productivity at work and at home by drinking enough water throughout the day. This is because a thirsty person’s brain consistently sends the message of thirst to the body. Satisfying that thirst frees the brain’s resources and improves a person’s ability to function, think and perform. That ensures that you can complete projects faster at work and home, all thanks to staying hydrated. 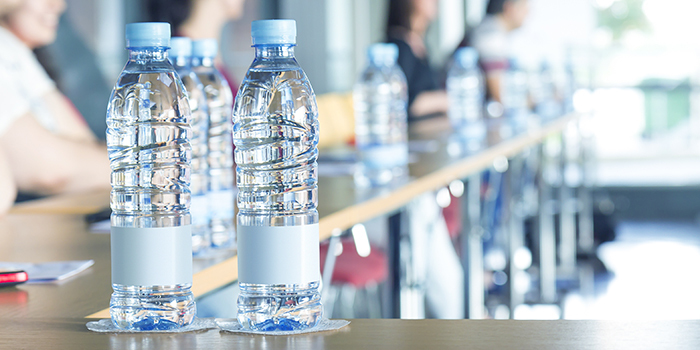 Studies have shown that just a 1% drop in hydration could lead to a 12% drop in productivity. A 3-4% drop in hydration could lead to a drop in productivity of between 25-50%. Not only this, but drinking water also makes us feel refreshed, improving our state of mind. Even mild dehydration has been shown to negatively impact moods. Taking this information into account as an employer, you have an opportunity support the overall wellbeing of your employees while ensuring high productivity at work. Something as simple as installing a communal water cooler or handing out branded drinkware can have a great effect on morale and hydration levels within your workplace. Hydrated employees are happy employees and happy employees are productive employees. Cheers to that!